What Is The Morning Writing Effect? Many writers anecdotally report they write best first thing early in the morning, apparently even if they are not morning people. Do they, and why? Ericsson 1993 notes that many major writers or researchers prioritized writing by making it the first activity of their day, often getting up early in the morning. This is based largely on writers anecdotally reporting they write best first thing early in the morning, apparently even if they are not morning people, although there is some additional survey/software-logging evidence of morning writing being effective. I compile all the anecdotes of writers discussing their writing times I have come across thus far. Do they, and why? The best data on sustained intellectual activity comes from financially independent authors. While completing a novel famous authors tend to write only for 4 hr during the morning, leaving the rest of the day for rest and recuperation ([Cowley, M. (Ed.). (1959). Writers at work: The Paris review interviews. ]; [Plimpton, G. (Ed.). (1977). Writers at work: The Paris review. Interviews, second series.]). Hence successful authors, who can control their work habits and are motivated to optimize their productivity, limit their most important intellectual activity to a fixed daily amount when working on projects requiring long periods of time to complete…Biographies report that famous scientists such as Charles Darwin, (Erasmus Darwin, 1888), Pavlov (Babkin, 1949), Hans Selye (Selye, 1964), and B.F. Skinner (Skinner, 1983) adhered to a rigid daily schedule where the first major activity of each morning involved writing for a couple of hours. In a large questionnaire study of science and engineering faculty, Kellogg (1986) found that writing on articles occurred most frequently before lunch and that limiting writing sessions to a duration of 1–2 hr was related to higher reported productivity…In this regard, it is particularly interesting to examine the way in which famous authors allocate their time. These authors often retreat when they are ready to write a book and make writing their sole purpose. Almost without exception, they tend to schedule 3–4 hr of writing every morning and to spend the rest of the day on walking, correspondence, napping, and other less demanding activities (Cowley, 1959; Plimpton, 1977). Stein 1974, Stimulating Creativity, Volume 1: Individual Procedures. New York: Academic Press. Puzzled, I began noticing in author interviews or writings that when writing times were mentioned, it was indeed more, often than not, partially or entirely in the morning (sometimes disgustingly early like pre-dawn), rather than usually in the evening as expected, and it became startling when I ran into an exception like Ian Fleming or Winston Churchill, who wrote at all in the evening, or Brandon Sanderson or Robert Frost, who work entirely into the wee hours. I am, again, not a morning person but I forced myself up early a few days and skipped my usual email & news-reading routine to focus on writing, and darn if it didn’t seem to work and the writing was worth the price in afternoon circadian slumps. Still couldn’t make myself do it regularly, though. If the morning writing effect is real (in the sense that successful writers do disproportionately write in the morning—which is still in doubt given the existing systematic survey evidence is limited to ordinary writers while the elite writers are represented so far purely by haphazardly-selected anecdotes), what is causing it? One possibility is that there is some sort of ecological fallacy going on: it is possible that, creativity really is higher in owls at night, owls do not improve by writing in the morning, but the best authors are still larks (rather than owls as one would assume from the population-level correlation) and do benefit from writing in the morning (or at least aren’t hurt); and this is because larks have other advantages in becoming the best authors, perhaps related to sheer writing volume & consistent output. No matter how creative it is, an unwritten book is no good. Larks then could write fine at any time and would be overrepresented among the best authors either way, because writing time is confounded with other Conscientiousness-related attributes. Looking through the anecdotes so far, while it’s true that devotees of “The Miracle Morning” and others frequently claim to not be larks and struggle to reap the benefits of morning writing, the elite writers who happen to write in the morning (currently) do not mention major struggles with getting up early or focusing in the morning, implying that they may well all be larks in the first place! A related but somewhat simpler possibility is that people are bad at scheduling and while late-night writing is no different than morning writing and just as effective in theory, people tend to choose to fill up their schedules, and repeatedly accidentally find themselves with too little time to write at night; every hour of evening writing that people do get done is just as effective as morning hours, but there are fewer such hours. Doing it in the morning is then simply a little trick to make sure that other obligations literally cannot come first. Another possibility is that the day really does use up some sort of ‘willpower’ or ‘creativity’: all the little things one does before the writing late in evening fill up one’s mind. There is nothing special about morning hours, they merely happen to be the conscious hours closest in time to sleep pushing the big reset button on the brain. If someone slept during the day & woke up at midnight, that person would then be best off writing at midnight, right after waking up, rather than 8 hours later in the morning, equivalent to their afternoon. (Tononi’s SHY theory of sleep would be a low-level neurobiological explanation along these lines.) These sorts of theories have a problem with the existence of authors who prefer to work at the end of their (subjective) day and are energized at night—why are they not just immune to what should be generic effects of biology/psychology, but positively energized? A version of this ‘thing building up/wearing out over the day’ is that it is related to ego depletion or ‘decision fatigue’1 or opportunity cost, where the increasing number of accomplished activities it becomes an excuse to write less—“I had a busy day, I can take it easy tonight.”—or one has difficulty truly focusing because there are so many other things which one could do (Kurzban’s opportunity cost model). Yet another version might be that sleep itself is the key: sleep, aside from any resetting, is also responsible for memory formation and appears involved in unconscious processes of creativity. Sleep is a long time period in between phases of working, allowing for the incubation effect to operate, and the incubation effect may be particularly benefited by sleep. So, one wakes up primed to work on the next piece of writing (that one has likely been mulling a long time), and by instead puttering around making tea or breakfast, one dissipates the potential. In this model, instead of one’s writing potential gradually deteriorating over the course of the day as the mind fills up/willpower is used up, it falls sharply and then hits a baseline and perhaps follows the usual circadian rhythms thereafter with a nadir at siesta time etc. This half-asleep explanation neatly explains why evening doesn’t work. It wouldn’t apply to falling asleep as there is an asymmetry: a half-asleep person in the morning who is writing is getting gradually more alert and spending the rest of the day awake, and can build on whatever mental seeds were planted; while a half-asleep person in the evening would frustrate sleep by trying to write, can’t write for long before falling asleep, and when they do fall asleep, would forget the preceding ~10 minutes. Or, perhaps it is a lack of sleep: sleep deprivation can cause odd mental states including mania and loss of inhibitions, and there is a peculiar but seemingly very real phenomenon where acute sleep deprivation in people with major depressive disorder substantially temporarily relieves their symptoms ( “Meta-Analysis of the Antidepressant Effects of Acute Sleep Deprivation” , Boland et al 2017). Many writers are melancholic, so early mornings, especially cross-chronotype, might be an inadvertent rediscovery of this to the extent that they shortchange sleep in order to get up. Perhaps most people are not in the throes of full MDD, but there might be a more mild effect. If the sleep-deprivation effect is the culprit, then writers who do this need to be cutting sleep considerably and the effects will be only temporary, since chronic sleep deprivation doesn’t help (and worsens cognition); this might also explain anecdotes where the person maintains that morning-writing works for them but they could only do it for a few days or once in a while—naturally, the more sleep deprivation the harder it is to get up, and as both the sleep deficit builds up & the anti-depressant effect disappears, they will find morning-writing increasingly useless and will stop. This might seem like an undesirable hypothesis but it still allows occasional benefits on carefully-chosen occasions, such as finishing or starting a novel. systematically go through the Paris Review interviews and the similar GoodReads interviews to note down all cases where an author is asked about writing time, rather than a few examples; this avoids the risk that morning writing advocates have selectively chosen examples from the interviews. As the writers are not chosen for their writing habits and the interview question are fairly formulaic, presumably the interview series could be considered a quasi-random survey sample of successful authors. The respondents tended to schedule their work between 8AM and 8PM, with the morning hours being the most common time of day (Table 3). Positive but nonsignificant correlations were obtained for these time intervals. Night owls were rare and not unique in their productivity. In terms of the duration of writing sessions, the data indicate a preference for one to three hours. Working for 1 to 2 hours was significantly correlated with productivity. But as will be explained later in describing the multiple regression analyses, this effect is best attributed to other factors correlated with the frequency of working for 1 to 2 hours. Highly regular work scheduling was not the rule; the most common response was only a 3 on the 7 point scale. “Write in spurts” and “marathon writing just before a deadline” were comments listed by respondents that match the pattern commonly observed in Boice and Johnson’s (op. cit.) survey. As in Boice and Johnson’s study, regular writing was positively correlated with productivity, but here the relationship was weak and nonsignificant. Another interesting aspect of Kellogg 1986 is that almost all variables correlate non-statistically-significantly with “productivity” (defined in Kellogg as the total number of books/papers/reports/grant-applications/grant-reports written in the previous 3 years), and most are of small magnitude. Measurement error & range restriction come to mind as biasing effects towards zero, but it’s still consistent with my own experience that it is difficult to find anything which strongly correlates with ‘productivity’, much less causes it. In the present study most of our productive psychologists had no real preference for any time of day at which to work. The morning appeared to be slightly preferred to the afternoon and the afternoon slightly preferred to the evening. Regular working times were correlated with overall productivity, but productive book writers wrote sporadically (in term time). These findings were very similar to those of Kellogg (1986) who showed that the majority of his 121 engineers worked in the morning, and then the afternoon, but that a highly regular work schedule was not the rule. 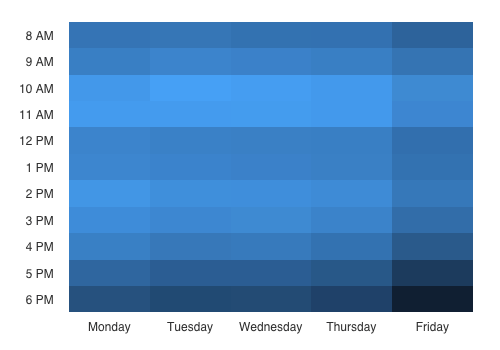 Looking at the time spent in software development tools, our data paints a picture of a workday that doesn’t get going until the late morning and peaks between 2–6pm daily…While writers are more likely to be early birds…Writing apps were used more evenly throughout each day with the most productive writing time happening on Tuesdays at 10AM. Allowing for the different time buckets, the RescueTime results closely parallel Kellogg 1986’s survey responses. Aside from being an enormous data sample, RescueTime notes an interesting contrast: despite being apparently similar activities (both mostly involve slinging text), the temporal timing of software development & writing are strikingly different. Thinking back, I don’t recall early-morning programming being a trend among programmers (programmers are infamous for preferring to come in late and late-night programming sessions which may wrap around the clock, especially in college—though the original reason, that “the computers are less busy at night”, has long since expired). It’s fascinating that the stereotypes about writing vs programming line up so well with the RescueTime data. If morning is the most common (replicating the Kellogg 1986 & RescueTime results), and if many evening-preferring respondents still answer that mornings work better for writing, that would be pretty good evidence for morning writing being a real phenomenon (although still leaving the causal status ambiguous and not answering the question of whether owls—like me—would benefit from switching to morning writing). This does not strongly endorse morning-writing, although it is surprising how many people think they write best counter-chronotype. Of course, the fact that fewer people believe they write better in the morning rather than evening doesn’t prove morning-writing isn’t a thing: one possibility is that people simply haven’t given it a fair try, or that it only works for professional writers at a high level, or that it is heterogeneous and there is a small fraction of people for whom morning-writing works really well (and so everyone should give it a try just in case). The overall even split of chronotype does give a baseline expectation for elite writers, though. Compilation of survey & individual authors’ reported writing time preferences. Kellogg survey 1986 Nonfiction Morning–afternoon 8AM–12PM, 12PM–4PM Kellogg 1986 survey Top 2 time-ranges; ordinal scale mean ratings >4 for those buckets, others, like 4AM–8AM, can be half or less. RescueTime users 2018 Nonfiction Morning 10AM–11AM RescueTime blog analytics This is the peak writing time; aggregate writing times span the clock. Gwern Google Surveys 2018 Fiction+Nonfiction Evening ? Gwern.net survey On average, respondents thought they wrote best at evening; survey respondents were more likely to prefer evening when writing counter-chronotype. Joseph Campbell ? Nonfiction Morning–evening 9AM–6PM Biography Campbell refers to “reading” in this anecdote of his youth; unclear if that includes writing or if he changed later. John Irving 1986 Fiction Morning–afternoon ?AM–?PM Paris Review interview Inferred from his description 8-hour days which terminate before “the evening” , reserved for research. William Gibson 2011 Fiction Morning–afternoon 9AM–?PM Paris Review interview Schedule varies in how late Gibson goes into the afternoon/evening, but assuming his Pilates classes are 1 hour, he doesn’t start before ~9AM. Deborah Harkness 2018 Fiction+Nonfiction Morning–evening ?AM-?PM Goodreads interview Harkness describes writing for the first hour every day as a “warm-up…the rest of the day kind of clicks along” . I would, for a four-week period, ruthlessly clear my diary and go on what we somewhat mysteriously called a “Crash” . During the Crash, I would do nothing but write from 9AM to 10:30PM, Monday through Saturday. I’d get one hour off for lunch and two for dinner. So during the years of the Depression I had arranged a schedule for myself. When you don’t have a job or anyone to tell you what to do, you’ve got to fix one for yourself. I divided the day into 4 four-hour periods, of which I would be reading in three of the four-hour periods, and free one of them. By getting up a 8 o’clock in the morning, by 9 I could sit down to read. That meant that I used the first hour to prepare my own breakfast and take care of the house and put things together in whatever shack I happened to be living in at the time. Then three hours of that first four-hour period went to reading. Then came an hour break for lunch and another three-hour unit. And then comes the optional next section. It should normally be three hours of reading and then an hour out for dinner and then three hours free and an hour getting to bed so I’m in bed by 12. On the other hand, if I were invited out for cocktails or something like that, then I would put the work hour in the evening and the play hour in the afternoon. It worked very well. I would get nine hours of sheer reading done in a day. And this went on for five years straight. You get a lot done in that time. But then, as you go deeper into Tomalin, you discover that Dickens, in his prime, used to compress his literary energies into five hours, roughly 9am to 2pm, after which he would walk incessantly, and put his mind into neutral. He might return to what he’d written in the morning later in the evening, but those five hours held the key to his output. Robert Frost, whose remote Vermont cabin I visited recently in company with his biographer Jay Parini, never started work till the afternoon, and often stayed up till two or three in the morning, not rising until midday, or even later. His appearance heralded by the harff, harff of his slippers, he enters the room in his scarlet, green, and gold dressing gown, the cords trailing behind him. Before greeting his researcher and the two secretaries on duty tonight, he must read the manuscript he dictated the previous evening and then revise the latest galleys, which arrived a few hours earlier from London. Since Churchill’s squiggled red changes exceed the copy set—the proofs look as though several spiders stained in crimson ink wandered across the pages—his printers’ bills are shocking. But the expense is offset by his extraordinary fluency. Before the night is out, he will have dictated between four thousand and five thousand words. On weekends he may exceed ten thousand words. Churchill’s night usually ends around 2 am, but when there is extra work to be done, he may not retire until 3 or 4. Saint-Exupéry wrote beautifully, but at the price of great effort. He went out rarely, but he had friends in almost every day to lunch and dinner. In the evening, when his friends had gone, he would brew himself a great pot of coffee and sit down to work at his dining table (his desk served merely as a catchall in which his checkbook could never be found). Now and then he would write in an all-night restaurant, where, having eaten a dish of raw chopped beef drowned in olive oil and crusted with pepper, be was likely to scribble from 2 in the morning until dawn. When be had written himself stiff, be would stretch out at home on a sofa under a lamp, take up the mouthpiece of a dictaphone, and record his copy, revising as he went along. Then, towards 7 or 8 o’clock in the morning, he would go to bed. The secretary would come in at 9 and type while be slept. Often, when friends arrived for lunch at 1 o’clock, they would ring and pound for 20 minutes before he woke up and let them in. A novel is such a long involvement; when I’m beginning a book, I can’t work more than two or three hours a day. I don’t know more than two or three hours a day about a new novel. Then there’s the middle of a book. I can work eight, nine, twelve hours then, seven days a week—if my children let me; they usually don’t. One luxury of making enough money to support myself as a writer is that I can afford to have those eight-, nine-, and twelve-hour days. I resented having to teach and coach, not because I disliked teaching or coaching or wrestling but because I had no time to write. Ask a doctor to be a doctor two hours a day. An eight-hour day at the typewriter is easy; and two hours of reading over material in the evening, too. That’s routine. Then when the time to finish the book comes, it’s back to those two- and three-hour days. Finishing, like beginning, is more careful work. Back then, I wrote all day, getting up at five. By this time, I rise scratchy at six or twitch in bed until seven. I drink coffee before I pick up a pen. I look through the newspaper. I try to write all morning, but exhaustion shuts me down by ten o’clock. Hunter Thompson: Carroll’s biography includes a supposed daily schedule where Thompson starts writing at midnight until 6AM (but the schedule is so clearly exaggerated & humorous in the level of drug use claimed that I don’t know how seriously to take any of it); one of his editors, Terry McDonnell says “When he got you on the phone in the middle of the night to listen to someone in his kitchen read to you what he had just written, all you could say was that it sounded good and that he should send it to you” ; a collection of letters includes him telling a landlady to put down carpets so his typing late at night won’t keep her up; his Paris Review interviewer describes him as keeping late hours on “Owl Farm” and the interview went into the night, where he describes his first writing job as having the advantage of letting him write entirely at night. All together, there’s no doubt Thompson preferred late night, and midnight-6AM specifically does seem plausible. I wrote the book in both Nigeria and the U.S. I don’t have a routine. I like silence and space whenever and wherever I can get it. When the writing is going well, I’m obsessive—I roll out of bed and go to work. I write and rewrite a lot and shut everything out. When it is not going well, I sink into a dark place and read books I love. Goodreads: What’s your writing process? I woke up (on that June 2nd) from a very vivid dream…Though I had a million things to do (i.e. making breakfast for hungry children, dressing and changing the diapers of said children, finding the swimsuits that no one ever puts away in the right place, etc. ), I stayed in bed, thinking about the dream. I was so intrigued by the nameless couple’s story that I hated the idea of forgetting it; it was the kind of dream that makes you want to call your friend and bore her with a detailed description. (Also, the vampire was just so darned good-looking, that I didn’t want to lose the mental image.) Unwillingly, I eventually got up and did the immediate necessities, and then put everything that I possibly could on the back burner and sat down at the computer to write-something I hadn’t done in so long that I wondered why I was bothering. But I didn’t want to lose the dream, so I typed out as much as I could remember, calling the characters “he” and “she.” From that point on, not one day passed that I did not write something. On bad days, I would only type out a page or two; on good days, I would finish a chapter and then some. I mostly wrote at night, after the kids were asleep so that I could concentrate for longer than five minutes without being interrupted.